Personnel, aircraft, and equipment from key partner nations working shoulder to shoulder while serving together in a multinational amphibious task force within maritime areas of Latin America and the Caribbean – this is what the future looks like in the minds of Marines and Sailors from U.S. Marine Corps Forces, South and several other regional military forces. In a time of competing requirements around the world, the staff of MARFORSOUTH recognizes that no single military service or nation has the resources required to successfully address all of the threats and disasters that can affect the Western Hemisphere. It will take the efforts of multiple regional countries to counter the destructive impact of natural disasters like hurricanes and earthquakes, as well as manmade crises ranging from illegal commercial fishing to illicit trafficking in narcotics and dangerous materiel, according to Bellon. Marines took the first steps in taking the vision of a multinational task force from concept to reality this year when a Colombian Naval Infantry officer, Lt. Col. Erick H. Del Rio, became a senior member of Special Purpose Marine Air-Ground Task Force – Southern Command. This multifunctional organization builds security force capabilities in Latin America and the Caribbean through recurrent training events. It is also trained and equipped to provide timely response to natural disasters and other crisis situations. Getting a partner nation officer on the staff of SPMAGTF-SC is only the beginning. 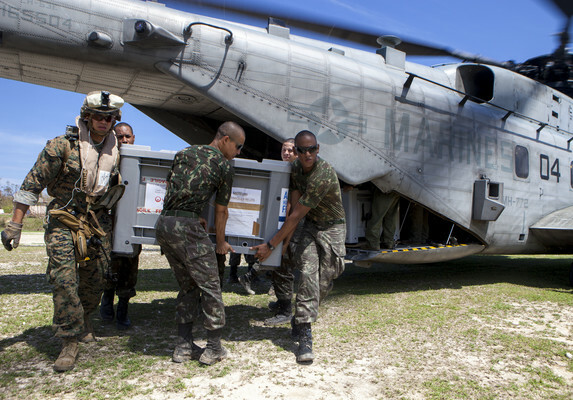 Later this year, U.S. Marines and regional naval infantry leaders will gather in Brazil to conduct UNITAS Amphibious 2018 – a tabletop exercise that focuses on planning humanitarian assistance and disaster relief activities. Tabletop exercises don’t involve actual movements of troops, ships, or aircraft. Instead, they focus on scenario-based discussions and contingency planning. Adding multinational assets to SPMAGTF-SC and changing the way regional partners conduct exercises reflect enhancements to how multiple nations could collectively address regional security, according to Bellon.